The Warhammer comics aren't for everyone. Let's get that out of the way right off the bat. Frankly, even that isn't specific enough to really get the point across: these comics are for existing Warhammer fans, folks who know the details of the series through and through, and all others need not apply. Dan Abnett & Ian Edginton don't make it easy on their audience. This story, set in a medieval fantasy world, wastes no time in driving that point home with both the tone and sheer quantity of its dialog. After just the first page, I'd already read more period-specific vocabulary than I could stand. Take this beauty, for instance; "The others quail and weep, lamenting their lot. There's nought to be served by such Maudlin vanity." I'm not even sure what that's supposed to mean. As with Shakespeare, I spent the majority of my time with this issue attempting to pick out a word or two that I recognized, deriving some sort of meaning from the narration that way. It's a slow, agonizing experience. Perhaps with a brief setting of the stage, I wouldn't have found myself so completely lost within the plot of this issue. Then again, considering the vast number of allusions and references to the past that the story makes, I worry that such a recap may have eaten up an entire issue or two unto itself. This series clearly takes place within a deep, well-developed mythos, but because I've been privy to precious little of it, I have no frame of reference. Rashan Ekedal does his part to dress these pages up, and sets a bleak tone for the story from the very first panel. His work is ideal in dark settings, such as the prison that opens this issue, where he's free to play in the shadows and use the infrequent light sources to paint strange shapes on faces and bodies. When his characters are bathed in full light, Ekedal loses his way and turns into just another mediocre talent. Gone are the intricacies on each character's face, the bold lighting choices and sharp touches of personality that we enjoyed in the darkness. On the battlefield, where such lighting is most predominant, his work is at its worst. As was the case with Damnation Crusade, the last Warhammer series I covered, this issue's fight scenes are excessively gory, which gives the book an immature flavor. When I was in middle school, I was all about spattered ink, errant eyeballs, severed heads and red-soaked steel, but nowadays I prefer something a bit more subdued. Handled effectively, blood on the battlefield can make for a spectacular visual, but in the wrong hands it's just another excess. 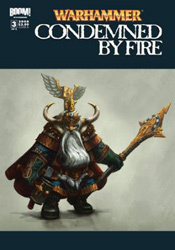 I can't recommend this series, whether you're a fan of Warhammer with an encyclopedic knowledge of its backstory or a fresh face looking to get his feet wet in time for Age of Reckoning. If you're the former, the slow pace, bad dialog and weak characters will put you off... the latter won't even get that far. Skip it. Condemned by Fire holds little of value.